Tus is Alt A’ Chiul Mhoir. 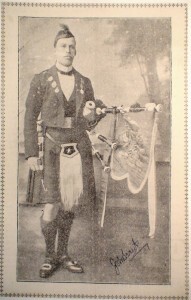 Among the list of Patrons, Patronesses, and subscribers, numbering considerably over one hundred, Mr. Grant has been fortunate enough to secure the patronage of the Royal Family, added to which are such well-known names as those of Lord Lovat; Captain Colin MacRae of Feoirlinn, Argyll; Kaid Sir Harry MacLean; the Macintosh of Macintosh; Colonel John MacRae-Gilstrap of Ballimore and Ellandonan; Captain G.M.L. Sceales; John Bartholomew of Glenorchard; Mrs. Macalister, Killean, Tayinloan, Argyll; James Grant, president, Clan Grant Society, Glasgow; Dr. Hew Morrison, of Edinburgh; Rev. Neil Ross, B. D., of Buccleuch Church, Edinburgh; Pipe-Major Webster, Aberdeen; W. Sutherland Mackay, S. S. C., 3 Clifton Terrace, Edinburgh; R. G. Lawrie, bagpipe maker, 58 Renfield Street, Glasgow; Rev. Donald MacDonald, the Manse, Ullapool, Ross; Alex. MacIver, Loch Eiltside, Lochailort; J. MacLeod, 5 High Street, Tain; Robt. McNab, Beaconsfield, Dunoon; Alex. Livingstone, Gruline, Mull; etc., etc. There are also numerous members of the Clan Grant to be added. The Highland Society of London; the Royal Caledonian Society, Bushey, Herts; the Piobaireachd Society; the Caledonian Society; the Caledonian Club; the Public Libraries of Edinburgh, Glasgow, and Dundee, and very many others have extended their practical aid to Mr. John Grant’s venture. In the definition of Piobaireachd, Mr. Grant has divided Ceòl Mór and eight different classes–The Salute, Welcome, Lament, Farewell, Gathering, March, Battle Tune, and the Warning. Among these sections we find various tunes composed by Mr. Grant himself. The names are easily remembered. Lord Archibald Campbell’s Salute; Captain John Campbell of Killberry’s Salute; Lord Lovat’s Salute; Major John MacRae-Gilstrap’s Salute; the Marquis of Bute’s Salute; Lament for Duncan MacRae of Conchra; etc. The most important part of the Piobaireachd is the Urlar, or Theme; or it might be termed the foundation. Mr. Grant likens it to a tree in this way. It has its Urlar, the root; its First Variation, its trunk or body; and it’s Toarluath and Crunluath, its branches. Mr. Grant defines various tunes. Spaidsearachd Mhic Rath, The MacRae’s March, he regards as “a wonderful tune.” It was composed about the year 1491, composer unknown. Cumha Mhic an Toisich, Macintosh’s Lament, is a most touching and pathetic melody. Many well known tunes are here defined, their source is not infrequently given as from Angus Mackay’s Collection. From every point of view the author’s subject has been dwelt upon; and the whole volume is one which readers will enjoy, even though they may not know the difference between Crunluath and Crunluath-Breabach. The weird and striking picture, “The Pibroch,” by Mr. Lockhart Bogle, makes an impressive first page illustration. Briefly stated, the work all over is that of a devout lover and believer in the Piobaireachd as the musical fortress or stronghold of the Highlander. Viewed from this standpoint, it will doubtless disarm hypercriticism. The Quarto Edition costs five shillings. The addition de Luxe is to be sold in aid of the funds of the Royal Caledonian Asylum, Bushey, Herts, and one guinea per copy.